New ways of communicating the effects of climate change are needed. Stephanie Pfirman, professor of environmental sciences at Barnard College, explores whether making a game of it will help spread the information. Stephanie L. Pfirman, Professor of Environmental Science and Alena Wels Hirschorn ’58 and Martin Hirschorn Professor of Environmental and Applied Sciences, joined the faculty of Barnard College in 1993, and serves as co-Chair of Barnard’s Department of Environmental Science. 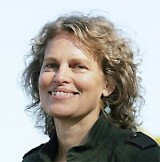 She holds a joint appointment with Columbia University where she is a member of the faculties of the Earth Institute and the Department of Earth and Environmental Sciences, and Adjunct Research Scientist at the Lamont-Doherty Earth Observatory of Columbia University. Prior to joining Barnard, Professor Pfirman was a senior scientist at the Environmental Defense Fund and co-developer of the award-winning exhibition, “Global Warming: Understanding the Forecast,” produced jointly with the American Museum of Natural History. She has worked for the House of Representatives, as a staff scientist, for the US Geological Survey, as an oceanographer, and for the GeoMarine Research Institution (GEOMAR) in Kiel, Germany, as an Arctic researcher. Her PhD is from the Massachusetts Institute of Technology/Woods Hole Oceanographic Institution joint program in Oceanography and Oceanographic Engineering and she has BA with high honors in Geology from Colgate University. Professor Pfirman’s scientific research focuses on the Arctic environment, in particular on the nature and dynamics of Arctic sea ice under changing climate. Her previous research activities have included melting and surging glaciers and pollution transported by sea ice. In 2010, Pfirman was elected as a fellow of the American Association for the Advancement of Science in the Section on Atmospheric and Hydrospheric Sciences. When people think about climate change, they often picture a polar bear. And while it’s true that these animals are threatened by rising temperatures, they aren’t alone: many other species depend on sea ice for survival, including ringed seals and walrus. Arctic Indigenous communities also use sea ice as a hunting platform to support their subsistence livelihoods. How can scientists help people better understand climate change impacts and what they can do to take action? More effective ways of communicating are needed, including innovative approaches like games. Take for example, a card game that helps people understand how Arctic species adapt and highlights what players can do to help protect the ecosystem. In this game of strategy and survival, called EcoChains: Arctic Crisis, players build a food web, learn about the importance of sea ice, see the impact of future changes, and take actions to sustain a healthy Arctic. But did the game advance understanding? To find out we surveyed people who played the game and others who read an article on the same topic. A month afterwards, surveys showed that those who played the game retained more new information than those who read the article and they had an enhanced sense of empowerment. They were also more likely to recommend the game to friends. Overall the game was seen as more interesting, fun and engrossing than the article. People are more likely to make informed decisions on climate change if they understand our legacy of social, economic and environmental consequences, and if they talk with others about this important issue. As this research shows, games are one way to help make that happen.